They packed us into fields like cans of sardines. By the time we arrived there were already thousands of people tailgating in the parking lots. 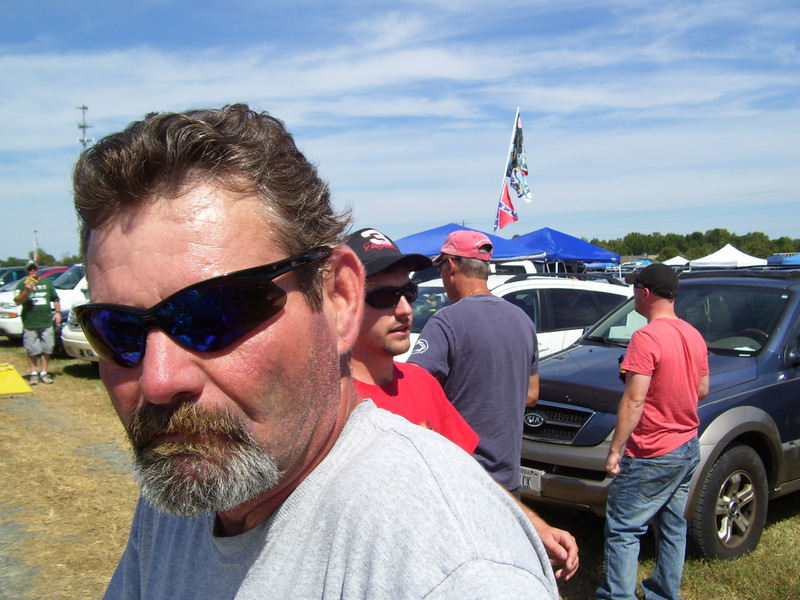 I tweeted that I’d died and gone to redneck hell, but John quickly corrected me, if I was truly in redneck hell I would’ve been in Talledega. Apparently at that track they have seating for a hundred thousand plus people, but every race over 400,000 show up just to party. 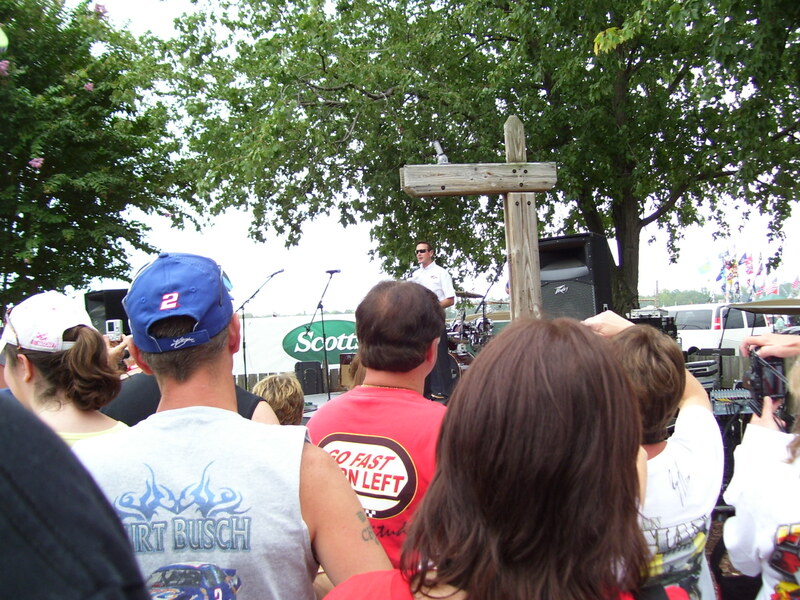 Notice the rebel flag flying in the background. Everywhere there were half-naked drunken girls dressed in daisy dukes and cowboy boots, people BBQing, playing washers and some sort of bean bag tossing game. They had gazebos set up in the tiny lanes between the rows of parked cars. Music blasting everywhere, all genres, from Lady GaGa to Toby Keith. When someone close to us started blaring some sort of rap I didn’t recognize I thought we were going to have an incident as my boys started muttering that Nascar was no place for N@$%er music. I muttered that Nascar was no place for a lady. 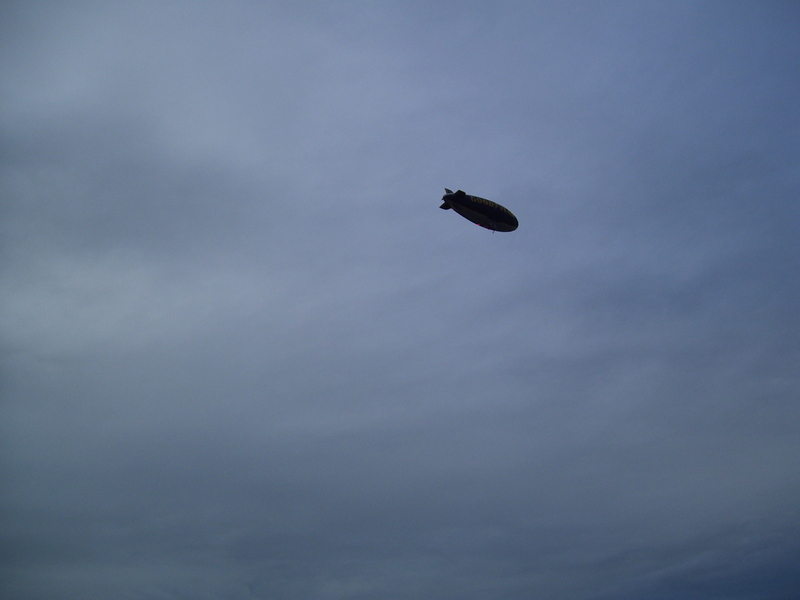 Good Year blimp flying overhead. We just hung out at the truck for the first couple of hours, nobody seemed in a hurry to go anywhere. I had a few beer, alternating with bottles of water because the day was super hot and I didn’t want to get dehydrated. The boys just drank beer after beer after beer though. 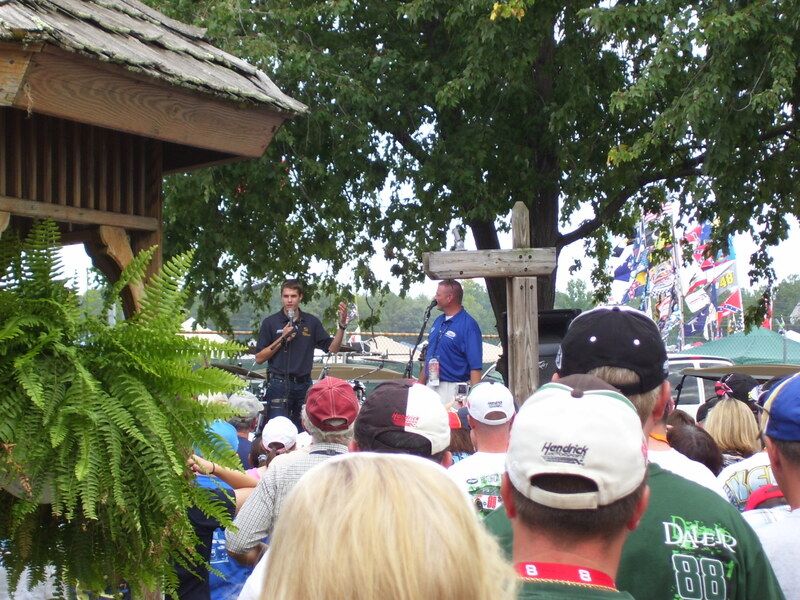 Finally Jay said we’d go find the Will Call booth and pick up our pit pass stuff. Bob and John stayed at the truck as ventured out through the jungle of vehicles noting the Coke signs on the big parking lot lights so we might be able to find our way back. There were guys wearing tinfoil hats (to keep the aliens away), huge line-ups for porta-potties that had definitely seen better days (perhaps during the Civil War). We found Will Call and the line wasn’t too bad, got our Pit Pass vouchers and tickets to the Green Zone where all the speakers, food, live music and bar would be. 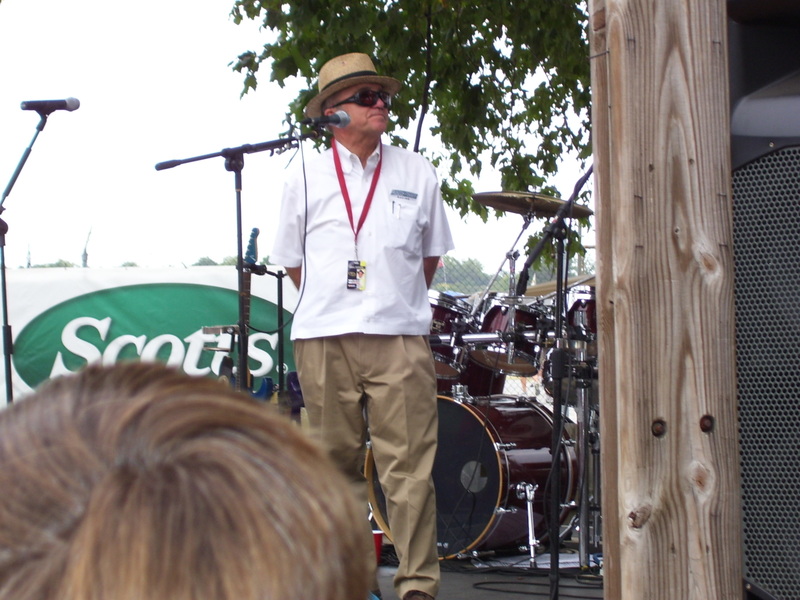 Then we had to stand in a much longer line to sign a waiver and redeem our Pit Pass vouchers. It turned out we couldn’t get Bob’s because he needed to sign the waiver himself. The lady gave me a hard time, saying I had signed for Jay and he needed to do it himself. But I hadn’t. I told her three times and pointed to the blank spot for his signature before she got that I had just filled in the number on his pass and printed his name for him. Jay wanted to look for a ball cap (as if he needs another one!) so we ventured over to some of the vendors booths nearby before heading back to the truck. He bought three beer huggies with Richmond & September 11th written on them because we had forgotten to bring huggies from home (as if we need even more beer huggies cluttering up our already cluttered cupboards). Then we found our way back to the boys pretty easily considering how many vehicles there were. Another couple of hours spent on the tailgate drinking beer (& water for me) passed. I was so hot and sweaty I had to get Jay to start the truck one time so I could take a break in the A/C. 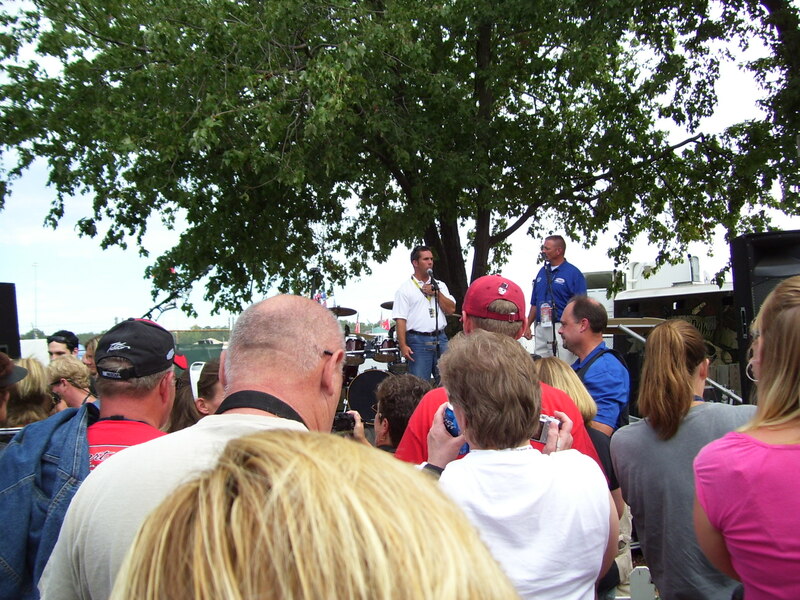 Then finally the boys decided that we should venture over and get Bob’s pit pass then head in to see what we could see. John opted to not pay the extra $90 and go with us. So he just stayed at the truck the whole time we were gone. When we entered the Green Zone they gave us each a commemorative race program, collectible toy car, and six tickets for beer. Night Ranger was just finishing up their set, so I didn’t get to hear Sister Christian which was the only song of theirs that I knew. 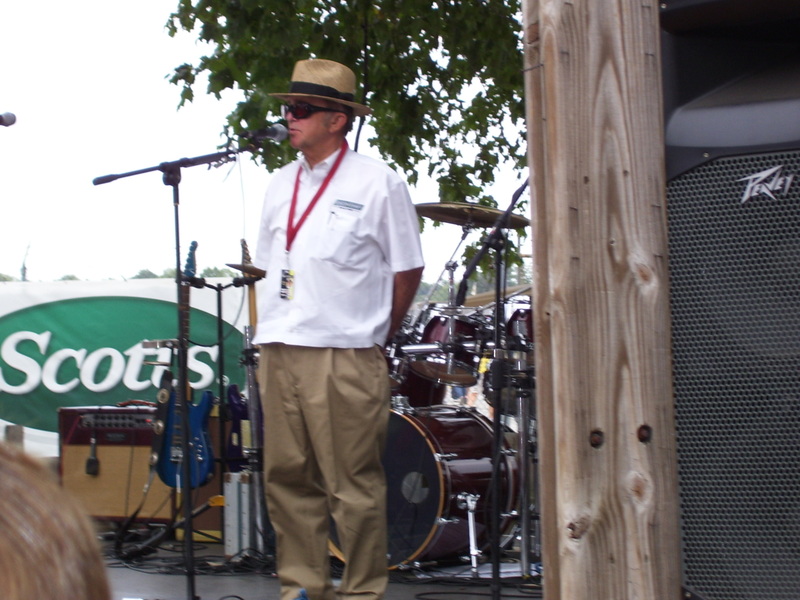 They did a brief Q&A with the band and then started bringing the Nascar people on for discussion. 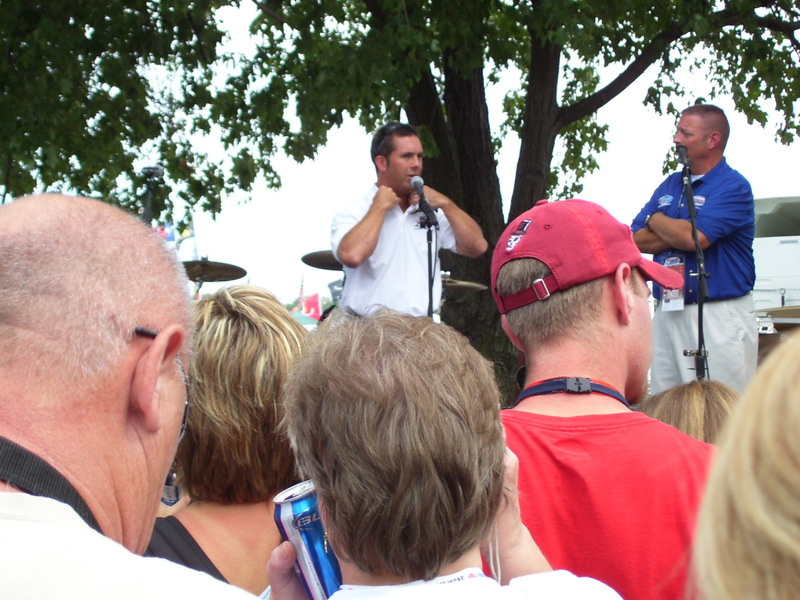 I believe this is Hermie Sadler. 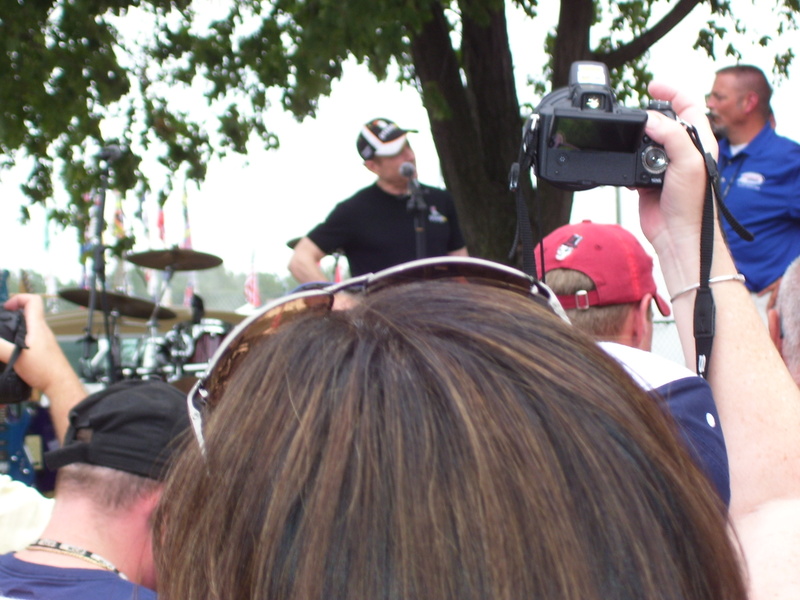 Every time someone would come onstage that the boys were interested in I’d run up front with the camera and snap shots. Honestly I don’t remember a word any of them said other than Mark Martin and Kurt Busch. Mark, I remember because he’s my favourite and seeing him in person was the highlight of my day. Kurt, I remember because he was actually surprisingly quite funny and entertaining to listen to. I really had no interest in anybody else. Jay was restless, wanting to go to the pits. He was afraid we’d left it all too late and wouldn’t get to go through everything, get back to the truck, and into our seats before the race started. 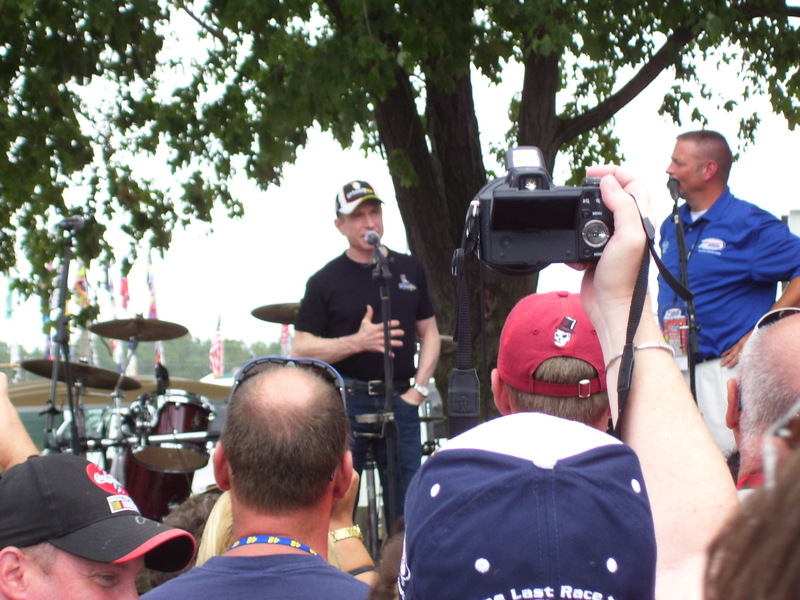 Mark Martin was scheduled as one of the last speakers though and I was adamant that I was not leaving until we saw him. Plus the speaking thing was due to end by 6pm, which would give us an hour and a half or so to see everything else and find our seats, plenty of time. 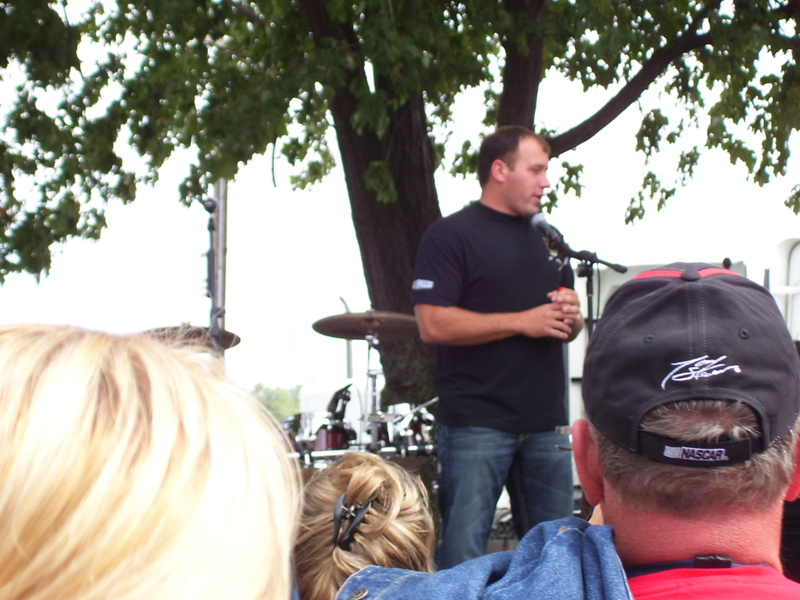 Well, at least I think that’s Ryan Newman … I really don’t know what many of these guys look like, lol. 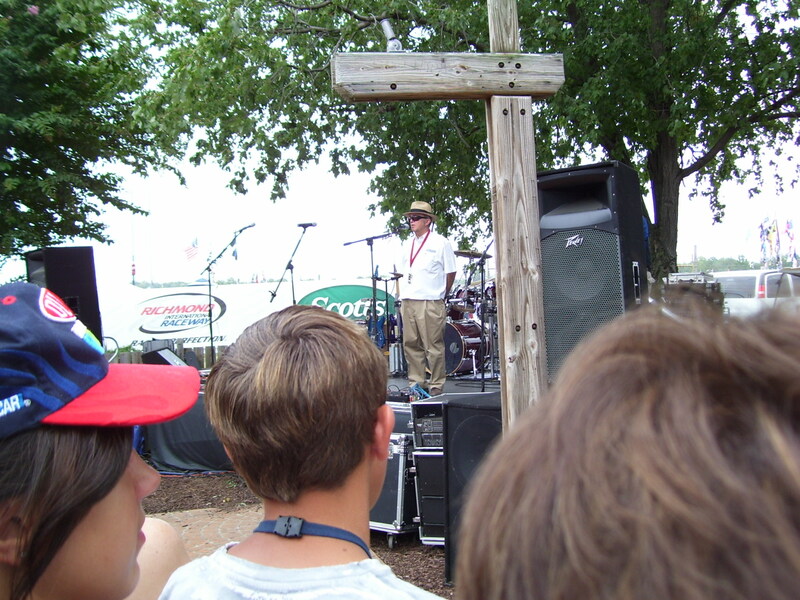 Is this David Ragan? 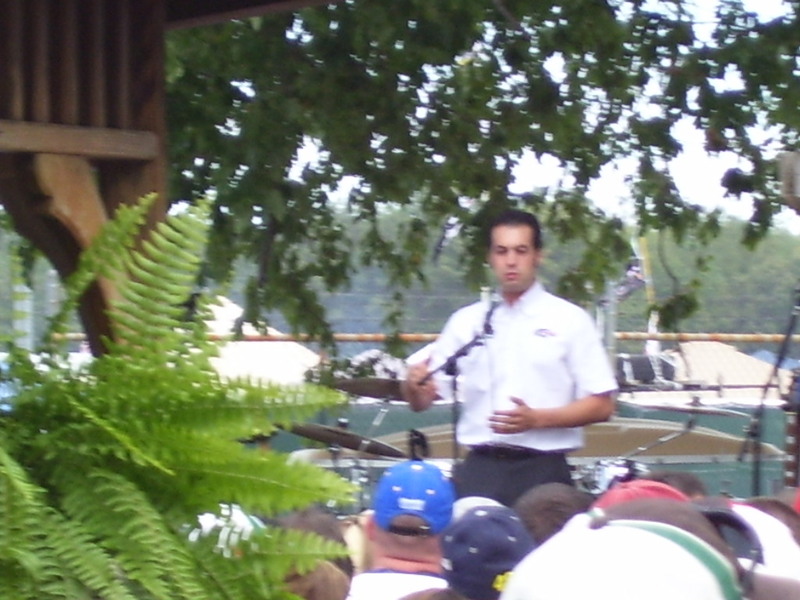 Sam Hornish Jr.? Oh wait, maybe this is Hermie? 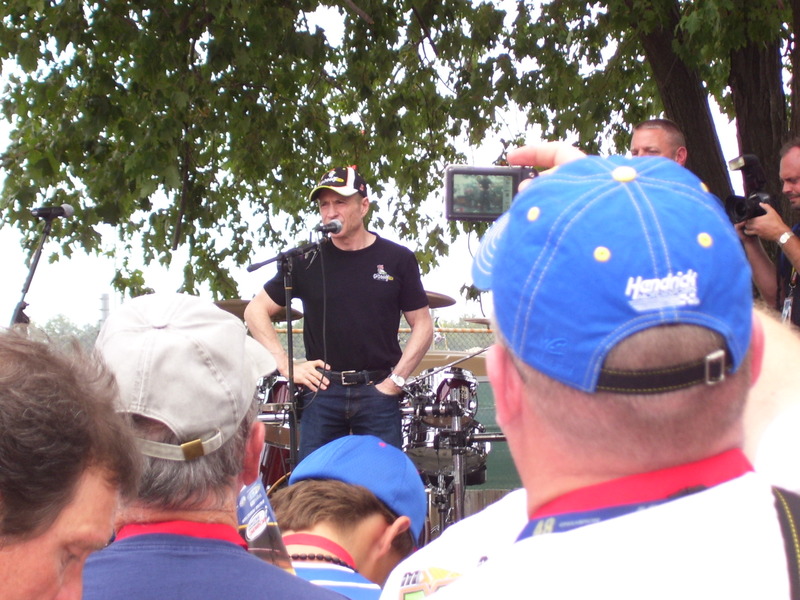 That’s the best shot I got of Mark Martin. I have to say this was totally the highlight of my day. I got a little starstruck! I was whooping and everything, getting all pumped up for the race, and for the first time I thought maybe this whole Nascar thing might be okay. 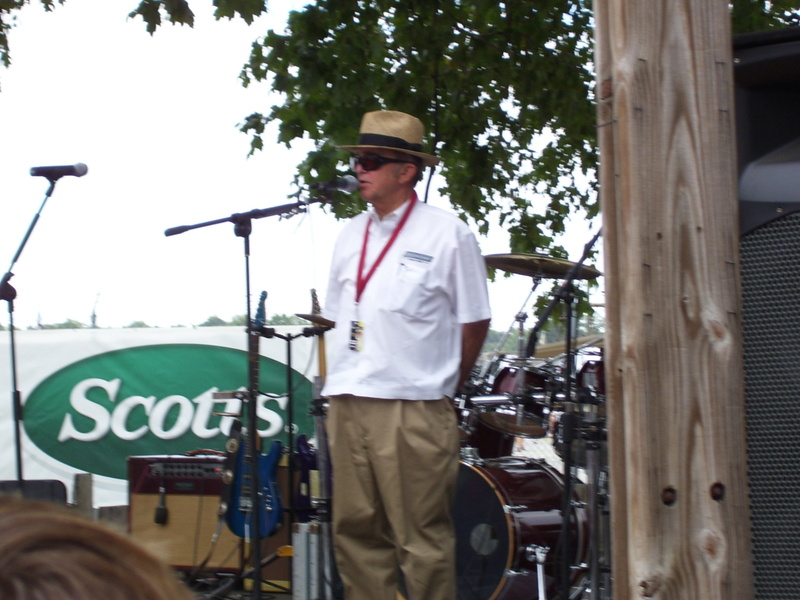 I took pics of Jack Roush for my sister, Sherry, and tweeted that I was listening to him at the Q&A just to give her a vicarious thrill. Though really I have no idea who he is. Bob really wanted pics of him too though and Jay seemed excited to see him, so he must be somebody important. 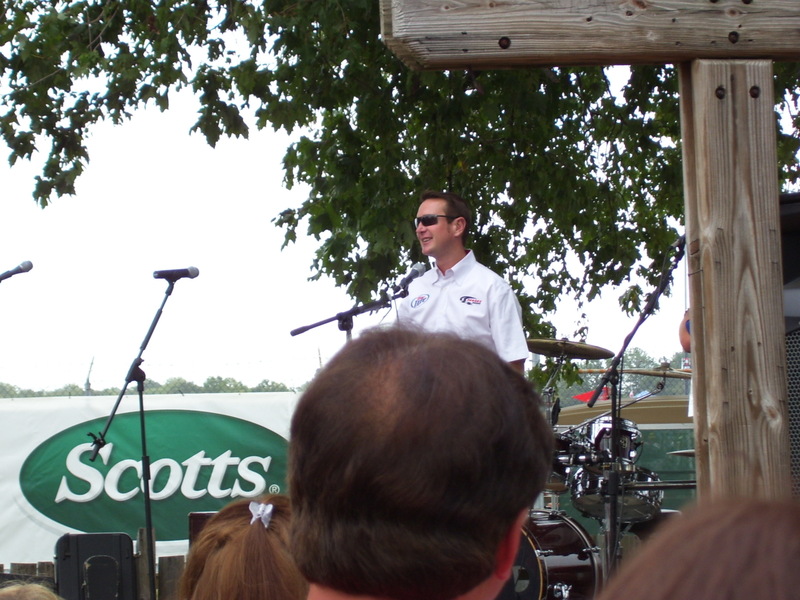 Even though Kurt Busch is a Vegas boy like my husband, Jay can’t stand him and actually booed him while he was speaking. I found him very entertaining though. I don’t care for his brother, Kyle, but he seems all right to me. 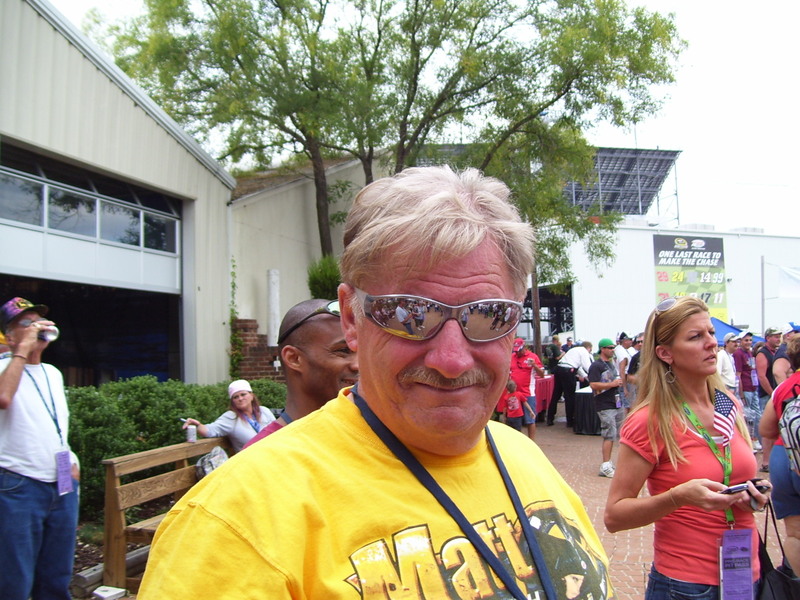 Bob in his funky sunglasses. Bob forgot to pack sunglasses, so Jay gave him a pair that he had a whole bunch of extras from work. They’re like safety sunglasses or something. This was the last pic I took in the Green Zone before we headed out to the pits.